Griffon Alpha Group provides our highly trained K9 Units (Guard Dog & Security Officer Handler) to clients from a wide range of industries when a fast, effective security response is required. Security K9 Units significantly reduce the risk of incidents, along with remaining the most effective security solution in situations requiring direct response and possible intervention. Our highly-specialised K9 Units are made up of a professional security officer and their trained Guard Dog, creating an unbeatable team for superior protection. K9 Units can detect potential intruders from long distances, even in difficult conditions such as bad weather and low visibility, allowing them to stop a break-in before it happens. In situations where a swift response is required to an alarm activation, break-and-enter building searches or potentially dangerous situations, a K9 Unit will offer an increased level of safety and security, and a faster resolution to the situation. All of our Griffon Alpha guard dogs receive training to the highest level of national security standards, and we are confident in their abilities to provide protection in any situation required. 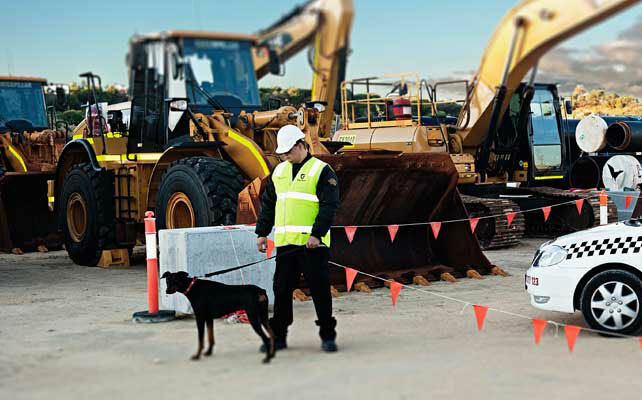 Each of our security officers in our K9 Units is licensed and certified as Security Dog Handlers based on NSW accreditation requirements. Our Security K9 Units undergo a continual training program to help them develop higher levels of security dog handling abilities, along with remaining in peak condition for responding to a security situation. Talk to us today about hiring Griffon Alpha’s K9 Units to increase the level of security at your premise.